Thankfully the vast majority of motorists understand that texting while driving is extremely dangerous. For those who aren’t aware, there are penalties and fines that should help drivers to understand the dangers they are putting themselves and others into when they text while driving. The fines for texting and driving vary depending on the nature of the offence, but you can expect to receive a standard £60 fine as a minimum. Along with a £60 fine you’ll also be handed 3 penalty points. If the case is severe and you have to go to court, you may be given additional penalty points on your licence and you could face a £1,000 fine. For the worst offenders, a disqualification from driving could be applied and those who are caught texting while in charge of a goods vehicle, a bus or a coach will be handed a £2,500 fine and can expect other penalties from their employer. 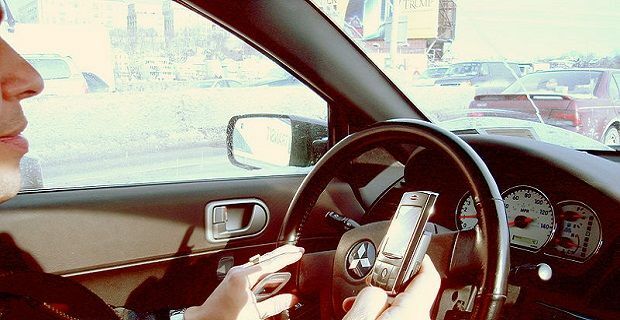 If you believe that these fines and penalties are a little draconian for texting while you drive, you’re probably underestimating how dangerous it can be. The fines handed out are not for the offence of texting while driving, they’re for the crime of driving without due care and attention. Using any hand-held device while behind the wheel is a criminal offence because you’re taking your attention from the road. But the law’s not black and white. Pushing buttons on a phone that’s in a cradle isn’t an offence, perhaps that’s because the actions needed to operate a phone in cradle are similar to those needed to work the controls for something like a car stereo or a satellite navigation system. The only exception to this rule is if you have to dial 999 in an emergency. In that circumstance, you won’t be penalised for using your phone while driving the car.